The BBMP, who did know of the Pooje, did not turn up but the residents indiscriminately came in droves and participated wholly. 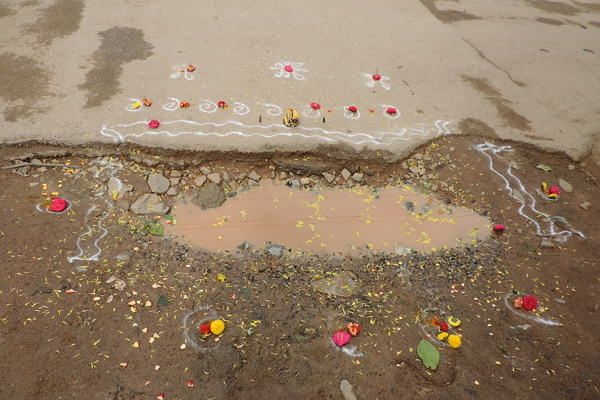 The Residents’ Welfare Associations contributed significantly in this cause due to the pathetic quality of roads in Bangalore. It is a huge area of concern for all, considering the fact that there have been multiple accidents resulting in deaths due to potholes. There have been a few cases, which have caused widespread outrage like Stuti Pandey, who was riding pillion, met with an accident and died, or the case of kindergarten teacher Uma Ramanan who was run over after losing balance over her two-wheeler, all due to potholes and bad quality roads. 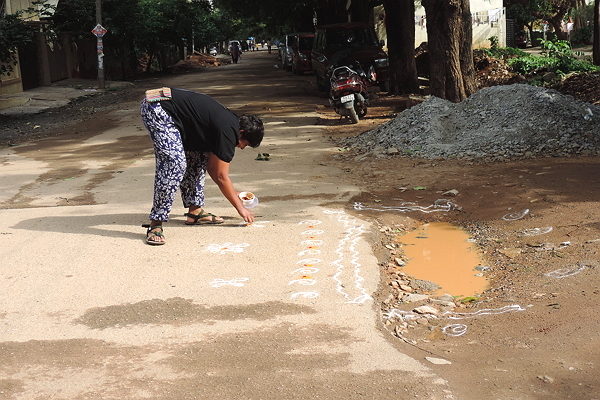 There was no response from the BBMP as on Saturday, however by Sunday they began floating tenders for the work and also asphalted the roads much to the delight of the residents. Such results can show how much can be done through creative and united endeavors, a message that B.CLIP heavily promotes. Though this quick response of the authorities was appreciated, citizens now wonder if this is the only way to ensure that civic amenities are provided to them.